Crazy week in the markets but our Algo’s have been rocking it with all this volatility. The wild intraday price rotation (in some cases 7~10x normal volatility) has been interesting to say the least and more importantly the recent results below prove the system can profit during both the low volatility we saw in July and this week’s insanely high levels similar to that of the 2008/09 bear market . With two trading systems available the S10 and D30 it may spark some questions as to what the differences are so… let me explain briefly. S10 system trades based on the 10 minute intraday chart time interval. This system depending on market conditions will generate 1-2 trades per day. Obviously during high volatility or extremely fast intraday price pattern we could see more trades. This system is very active during strong sideways markets (trendless) similar to what we have experienced the past 12 months. D30 system runs a swing trading strategy on the 30 minute intraday chart and is very effective trading both rising and falling trends. These trades will typically have larger winning traders and larger losing trades because of the increased timeframe it trades and larger price patterns. IMPORTANT – the D30 also has the S10 system traded within it and the “D” in the name stands for Dual as it trades both intraday and swing strategies. I would like to touch on a few critical things to be sure you understand our system, its trading and risks. If you have not noticed yet we at AlgoTrades are an open book. We don’t hide information from you, we are not selling a system that requires you to download, setup, tweak, and manage it like so many others out there. We are the exact opposite as we run, manage, improve and trade these systems with our own money. So let me share what our system is and more importantly what it is not. Our system is not the holy grail of systems – there is no such thing. The system will have winning streaks, and more importantly it will have losing streaks. We expect drawdowns to be within the norm for futures trading of 20-30+% of our minimum required capital. The recent volatility in the market has caused a few $1100 – $1400 losses recently and that is well within the norm and must be expected. Futures are highly leveraged and move fast which is why we have spent years creating, improving and refining our strategies and systems to manage positions efficiently. They are not to be used with the majority of your investment capital. But rather a small portion of your portfolio to help increase gains during both rising and falling markets. Anyone trading the system at 200% or more should think about starting with just 100% and increasing the amount traded once you get a feel for the trading. 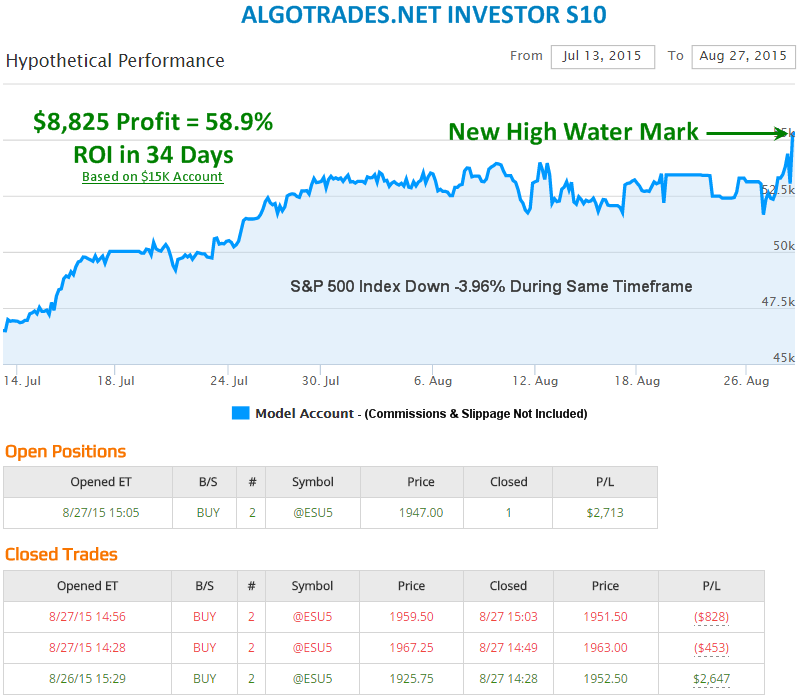 What the AlgoTrades Systems Are: They are proven trading strategies that have been automated to save time, reduce human error and emotions, while at the same time increasing return on invested capital. I (Chris Vermeulen creator of AlgoTrades) built the system and continue to improve on it because I actually trade my system with real money and being an entrepreneur and full time trader my goal is to leverage my time, money and skills to make as much money possible. Let’s face it we are all traders because we all want to make money and there is nothing wrong with it. So I am sharing my trading system with others as it does provide an additional income stream. But the fact is there is a very clear limit as to how many of us can use this system before slippage becomes an issue and we start to lose our edge in the market. I have no doubt that within a few months this system will be a closed system meaning we cannot take on new users in order to protect our market edge and allow substantial growth within all of our accounts over the next 5-10 years. I hope all this makes sense to you. I am excited to announce that users with an account at TheFOXGroup brokerage starting Sept 1st will have a dramatically lower trading commission rate. Our previous commission was $13.15/side per contract. We will be releasing more exciting news for users but it’s still a little premature, So stay tuned because it benefits all new and current users! These new and improved systems go live on Sept 1st Signup Today To Save Before the Offer is Gone Forever (ONLY FOUR DAYS LEFT).